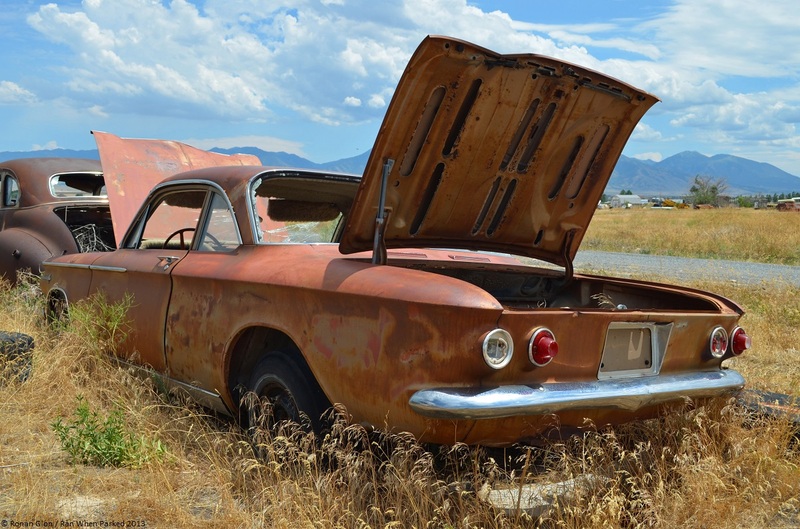 Infamously written off as being unsafe at any speed, the Corvair is diametrically opposed to just about every single mass-produced car Chevrolet has built in its long history. The two-door variant was introduced in January of 1960 and the lineup consisted of the entry-level 500, the mid-range 700 and the performance-focused 900 Monza. The 700 was the most popular model but the 900 influenced a wide array of competitors over the course of the 1960s. We photographed this early-1960s 700 model in a large junkyard that specializes in offbeat American cars. One of over a dozen Corvair in the lot, this first-generation coupe is largely rust- and accident-free but it has been stripped of most of its usable parts over the past couple of decades. A look under the decklid reveals the air-cooled flat-six engine has been replaced by a wooden board. We doubt this was done at the junkyard so it likely indicates the car ended its life as either an aborted project or a parts car, and the last owner installed the shelf in the engine bay to securely store parts. The other notable aspect about this Corvair is found by peeking inside. The dashboard and the door panels have been painted turquoise and upholstered with an inch-thick layer of synthetic fur. These dubious modifications were undoubtedly carried out in the 1970s and might have contributed to the car’s demise once shag carpet and bright colors rightfully went out of vogue. I still enjoy the Corvair and own 5 project ones myself. I’m diggin’ the shag carpet on the dashboard!